Supreme Court nominee Elena Kagan told government interns last year to "do what you love, always do what you love." Washington (CNN) -- Funny and flip. Confident at times, nervous at others. An earnest student and a meticulous lawyer. 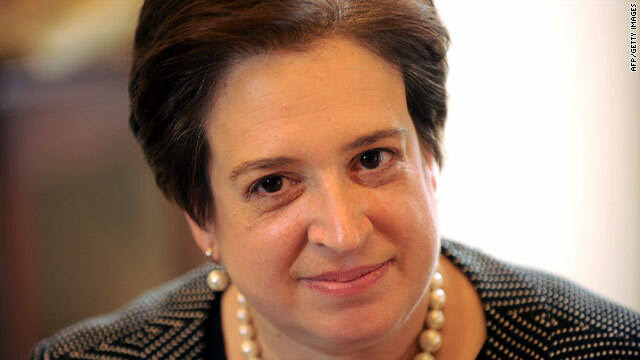 Newly released documents of Supreme Court nominee Elena Kagan's not-so-distant past reveal a determined, often blunt-speaking woman with an occasionally silly side. The examination of thousands of pages of documents from Kagan's years in college and from her various professional posts in academia and government are part of a ritual every high court nominee endures, as every aspect of their past is scrutinized. Found in the papers, beyond the serious discussions of her views on hot-button issues are some lighter moments. The material begins with her work as a cub reporter for her undergraduate newspaper. She wrote about student council meetings, football and field hockey, and various protest marches. After serving as a top editor her senior year, she and three colleagues offered a personal farewell in January 1981. "There are days when the three of us have trudged back to the Daily Princetonian edit office, tried futilely to turn off the heat that makes even the furniture sweat, breathed in the cigarette smoke that one of us insists on exhaling," Kagan co-wrote, referring to her bad habit, "and wondered why we were here. ... As reluctant as were to admit it, we've taken a certain pride in putting out this page over the past year." Skip to her time later as dean of the Harvard Law School, where administrative duties often left room for rhetorical mischief. Welcoming students back in 2008, the dean gushed about new dorms available to students. "Amazingly enough, some of you don't seem to appreciate the privilege of living in a modernist landmark, albeit one that bears a passing resemblance to a concrete bunker." The opening of an ice rink left her almost beside herself with excitement "in the spirit of trying to make lemonade out of lemons," she noted of her efforts to fund the facility. But wait, there's more, students: "free hot chocolate and doughnuts served (but only on this inaugural day)!" And Kagan took a soft jab at rival Stanford Law School in sunny California: "They can't do this in Palo Alto, you know." Little touches seemed to matter much to the dean. She offered free pies to the faculty around Thanksgiving, and free reusable water bottles for students, to cut down on disposable plastic. "I feel a little like Oprah here," Kagan said about the school's Earth-friendly initiatives. "Though I guess if this were Oprah, we'd be giving you Prius [hybrid car] instead of a water container." In one of her regular open letters to the Harvard community, "From the Dean," she bragged that five of the nine Supreme Court justices on the bench in 2006 had attended the law school. "One thing's for sure: The life of a judge is not dull," Kagan assuredly explained, although she had never been a judge, or at that time had never argued or litigated a case before a court. A scary moment came when a threatening message was posted on the internet in June 2008 from someone claiming to be an angry Harvard student, promising to bring a gun to class and targeting Kagan directly: "Elena Kagan and all those a------s are going to pay." The dean calmly warned faculty and staff to report any suspicious activity and to not publicize the threat. Leaving Harvard for the solicitor general's post left her uneasy. In a January 2009 letter she said, "I feel today real sadness, a sense of loss of what, if confirmed, I will be leaving that is every bit as strong as my sense of anticipation of what will be to come." She also notes "a special touch of sweetness" that the nomination was made by President Obama -- himself a Harvard Law grad -- "in whose capacity for greatness I deeply believe." Months later she wrote of a growing anxiety as she related to summer interns at the Justice Department where she then worked. "Four weeks from Wednesday -- not that I'm counting -- will be my first argument as solicitor general and also my first argument at the Supreme Court." She eventually lost that blockbuster appeal, as the justices gave corporations greater power to spend more freely in federal elections. The solicitor general is the federal government's chief legal advocate before the Supreme Court -- defending federal laws and executive actions. "General Kagan" -- as she is known when referred to by her formal title -- was careful to note she is not a military person, or the surgeon general -- "the person who put all those warnings on cigarette labels"
"General" means she deals with a variety of issues and appeals. "Calling me General Kagan makes about as much sense as calling me Comprehensive Kagan," she said to laughter at an event a few weeks ago. "But I kind of like the title anyway." Kagan and Supreme Court Justice Antonin Scalia seem to have a special rapport from her brief time arguing before the court. Honoring him at a 2007 dinner -- "a kind of party"-- Kagan noted Scalia was a 1960 Harvard Law grad. "The most notable fact about him," she joked. She couldn't praise the then-70-year-old jurist enough, calling him a man of "style and panache"; "the most colorful, the most intellectually playful, the most provocative"; "indubitably its greatest writer"; "the most important justice on the court"; and "the justice who has had the greatest impact on the law over the years, whether we disagree with his positions or not." Do what you love, always do what you love. An equal comfort levels exists with young people. Kagan is at her most eloquent and humorous when addressing students, bringing a causal freshness to her remarks. In 2007, she told incoming Harvard first-year law students, an ambitious, accomplished group, that they should appreciate all they have. "Relax, have fun. The competition is over," she advised. "Here's the really cool thing: You've won." And last year she told government interns to "do what you love, always do what you love." From public service can come great professional joy, jobs "that fill people over the course of their careers with the greatest degree of satisfaction." It can make one believe "they're making a positive contribution for the world and making a difference."